Trentside what it was used for ? 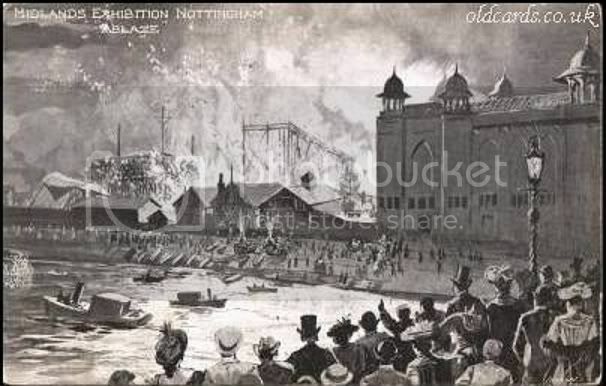 The Midlands Exhibition...there was a big fire there.I think it was accepted in Victorian days that all exhibitions eventually burned down. It is where the Rushcliffe Civic Centre is now. It's a pity it's gone,it looked great next to the bridge.It was an impressive building...The Dome builders in London should have taken a few tips. Yep, I pretty sure it's the Plaza Cinema On Trent Bridge. It was destroyed by fire and stood derelict for many years. We used to play in the place. It was very dark and spooky with the screen hanging down in tatters and pigeons would suddenly flutter out of crack and crevices without warning. Is there some technical reason why no company is able to construct attractive and interesting buildings any more - or are they/we just a bunch of Philistines? Everything is done on the cheap these days, StephenFord. Like you I love the old buildings built in the Victorian times. They are so interesting to look at and seemed to have been built with thought for the surroundings. In this I am thinking of the amazing neo-Gothic architecture by Watson Fothergill, and some of the interesting buildings designed by TC Hine. But there is a downside. These buildings are expensive to clean and maintain. Most modern buildings are smooth sided and easy to clean and probably not even designed to last a long while and like Michael Booth says, cheap to knock up (and depressing to look at). I can remember my mum and Dad moaning about the demolition of All Souls church in Radford. They said the modern building is ugly compared to the beautiful old church they got married in. I agreed with them on the visual effects, But I reminded them that regular worshippers are glad of the central heating - more affordable in modern buildings. In those old churches any heating went up to the high ceiling long before the congregation felt any effects. It is probably the same comparison between old and new buildings people have to work in. The Plaza was another building.... built in '32 closed in '42 and demolished in '55. 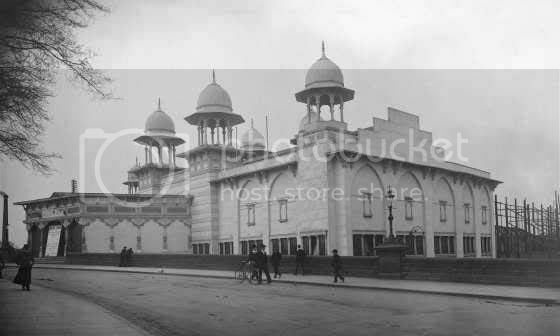 Several of the posts early in the thread had identified it as the Exhibition Centre. As poohbear points out, the Plaza cinema was another building, although very close by. 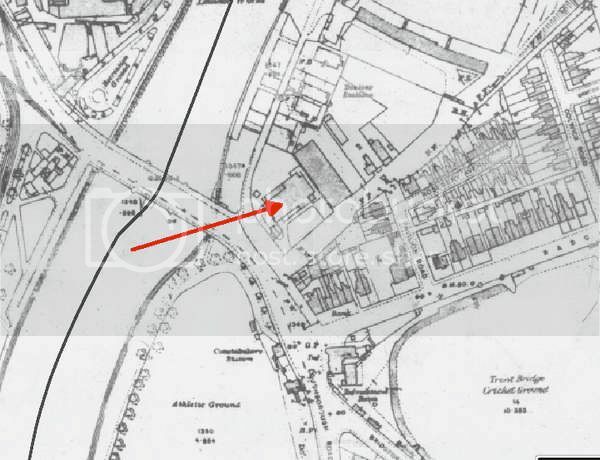 And it was here, roughly on the site where the Exhibition had been. I know there are some people who are never pleased - but have you noticed that some of the modern supermarkets are built with the intention of camouflaging what is in effect a massive warehouse to look like something less gaunt. But even then they only manage to make it look "twee" - as though it was built from a giant box of Noddy's building bricks. Oh alright - so I'm just a grumpy old curmudgeon ! Stephen. I thought all modern buildings were camouflaged warehouses. Talking of which, any opinions of the university buildings on Triumph Road at Radford? 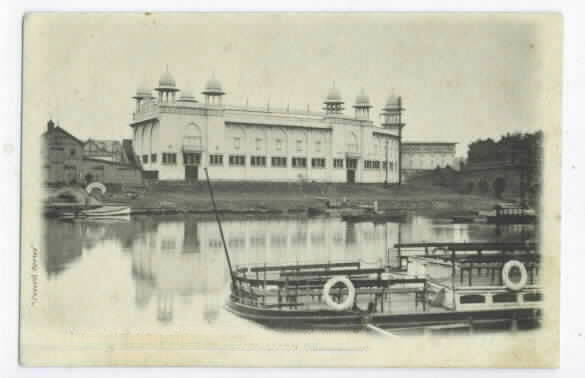 "This view shows the Pavilion Cinema behind the cranes. 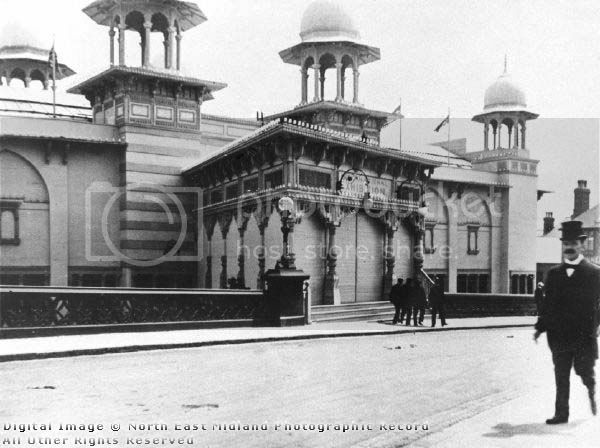 The Pavilion Cinema was named after the Industrial Exhibition pavilion which stood on this site in 1903-4. It then became the Palace Theatre from September 1927 until December 1931. (It re-opened as the Plaza in May 1932. The Plaza was open until March 1942.)" 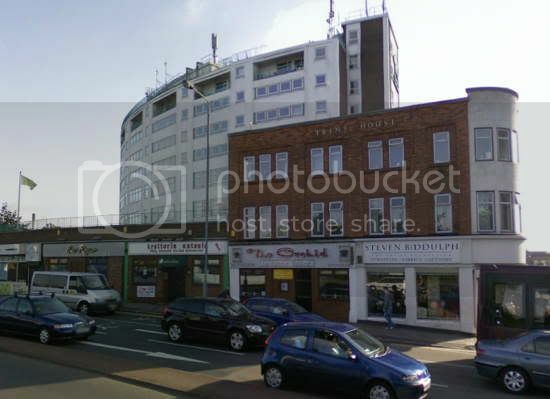 If the above information is correct, the Plaza was the last in line of theatres on the site of the old pavilion. Whilst everything would indicate that the Plaza was demolished sometime in 1955, I remember that the entrance abutting onto the roadway still remained standing for a time after the remainder of the building was demolished. I crossed the Bridge twice a day, 5 days a week from 57-62 while attending BHGS and ACHS and saw this eyesore most times. 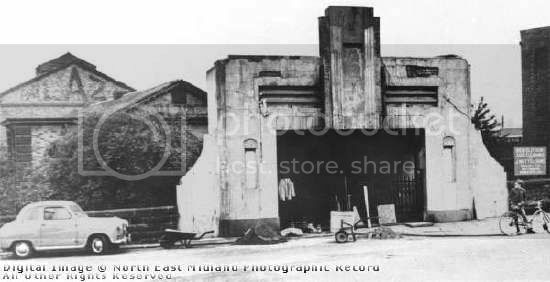 I distinctly remember the white and blue painted walls of the entrance and the steel concertina gates across the actual entrance and the boarded up doors behind. Between the steel gates and the doors was an area that seemed to collect all the rubbish blowing around the area. 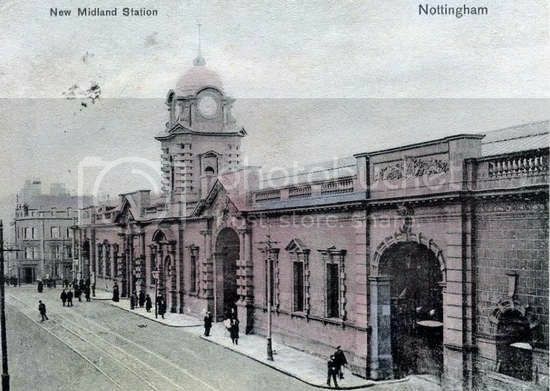 The picture side of the postcard is a bit more straightforward, although it's interesting because it refers to the New Midland Station (the card being written in 1904). I reckon that Nottingham Station and Leicester must have been designed as a pair. The frontages are very similar. The old Nottingham Midland station on station street was becoming a bit jaded and too small for the increased rail traffic of the day. A new station was due, but when the Midland Railway hierarchy realised what an amazing building the Great Central was constructing in nottingham for their London Extension, they seriously needed to compete. Leicester was rebuilt in 1892-4, so there was a substantial gap between the two. A E Lambert was the architect of the new Nottingham station. He also designed Nottingham Victoria. Leicester was designed by Charles Trubshaw. I think the Midland Railway was just going through a phase of doing covered concourses for its major stations. Sheffield Midland also had one - though without the tower, but with more open arches. The site at one end of the station on a bridge over the railway tracks might dictate that Nottingham and Leicester ought to be similar. To tell you the truth, I think the Nottingham one is more attractive. And not because both myself and my son used to work there. Interests:Old Nottingham, The Pubs, The Clubs & The People. As I stated in my first post in July this year, I had spent some time looking through the site and found it very interesting, particularly where posts would be instantly corrected by another member if incorrect or ambiguous information was given, and the debates that followed from these. I felt that I could contribute to this, hence my joining. Two of the topics, both about the same subject, which I found very interesting & had no previous knowledge of were Post 1# of THIS topic & Post 1# of Midlands Exhibition Nottingham Fire Disaster, dated 28th November 2006, both by Mick2me. A few weeks later I was loaned some Railway Memorability from the 1890's to 1920's by a friend to put onto the site for what appears to be a strong contingent of Railway enthusiasts. 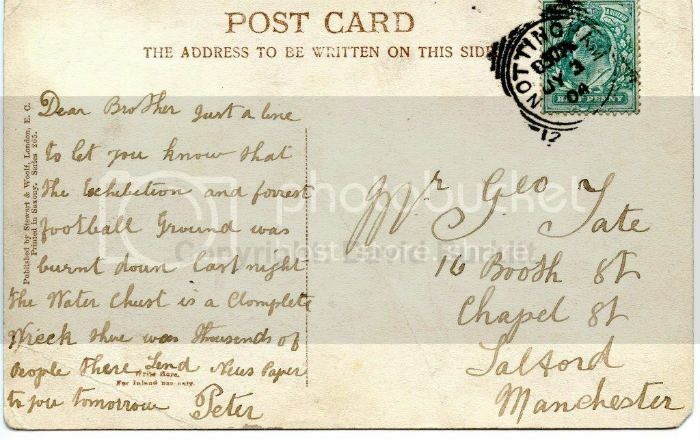 Amongst these were a few postcards one of which referred to the information in the two aforementioned Posts. Like everyone, I remember certain Historical dates like 1066, Mums Birthday, March 17, April 23, July 4, we all have our own memory bank of dates and when someone mentions one of these dates for whatever reason, our memory jumps into gear and we think Wife's Birthday or whatever. This was the case in reading the message on this postcard & the date in question was July 4th. There was an anomaly. In order to protect the copyright of my friends property I ask Cliff Ton to post it for me on the site, which he kindly did in Post 18# of THIS TOPIC. I though that one of you would notice the anomaly and quickly point it out. Alas, none of you spotted it, maybe because Post 19# digressed from the subject, whatever. I feel it would be a shame to miss it. Please have a look at it and compare the information with the other two posts mentioned. The display of this card and the message it contains rewrites a small part of Nottingham History if its content is accepted & is a world exclusive to Nottstalgia.